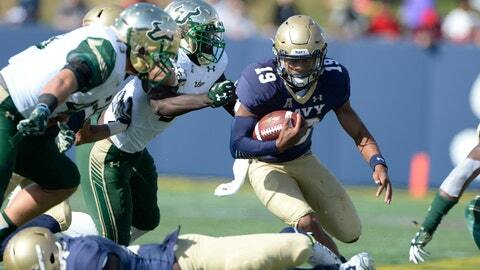 Navy Midshipmen quarterback Keenan Reynolds (19) runs with the ball during the second quarter against the South Florida Bulls. ANNAPOLIS, Md. (AP) — On his way to earning a place in the NCAA record book, Keenan Reynolds showed his potential as a head football coach. Reynolds scored twice in the fourth quarter to tie the collegiate mark for career rushing touchdowns, and Navy set a school record with three 100-yard rushers in a 29-17 victory over South Florida on Saturday. The Midshipmen never led until Reynolds bulled in from the 1 to make it 22-17 with 6:58 left. After South Florida fumbled the ensuing kickoff, Reynolds clinched it with another 1-yard touchdown run with 1:49 remaining. Reynolds’ final TD came on a fourth-and-goal after a sideline chat with coach Ken Niumatalolo. "I was going to kick the field goal just to go up by eight," Niumatalolo said. Reynolds would have none of it. "I said, `Coach, we don’t need to kick a field goal here,’" Reynolds recalled. "Let’s don’t give them any life. They’re not going to stop us on the 1." Reynolds was right. Following his fullback, the senior quarterback scored his 77th career rushing TD, tying former Wisconsin running back Montee Ball (2009-12) for most in NCAA history. "The kid is smarter than I am," Niumatalolo said. Reynolds didn’t convince his coach to keep the offense on the field because of the record. He did it because it was the best way to assure Navy a victory. "It’s just a number," Reynolds said of his touchdown total. "At the end of the day, it was just about getting ahead and putting the game out of reach. We were able to execute that play. It’s a big deal, obviously. I am very blessed and fortunate. But I always deflect the attention to my teammates because it’s 11 guys out there working." Nose guard Bernie Serra, who was in the room when Reynolds was talking, added this: "I hear him saying it’s just a number. Yeah, it’s a number — a really big number." Reynolds finished with 117 yards rushing, Dishan Romine had 115 and Chris Swain totaled 131 for Navy. The victory made the Midshipmen (6-1, 4-0 American Athletic Conference) bowl eligible for the 12th time in 13 years. Navy has ties to the Military Bowl but could go to a more prestigious venue if it wins the AAC title game. Rodney Adams took the opening kickoff back 97 yards for South Florida, but the Bulls (4-4, 2-2) scored only one other touchdown. The defeat ended their three-game winning streak. "Tough loss," coach Willie Taggart said. "Navy beat us in every phase. We made some mistakes that we can’t make against a winning and mature football team like Navy." Those miscues included two missed field goals and a two fumbles. Navy trailed 17-16 before Reynolds launched an 80-yard drive for the winning score, accounting for 56 yards on seven carries. Before the Midshipmen took the field, Reynolds had a message for them. "I just told the guys, it’s gut-check time," he said. "If we want to be a great team, this is where it starts. All of the goals we have as a team, it’s an opportunity." After Reynolds scored, Adams lost the handle of the following kickoff. Navy then covered 42 yards to increase its lead. The Midshipmen finished with 428 yards on the ground, its most since Sept. 6, 2014, against Temple. South Florida went up 17-13 in the third quarter when Marlon Mack scored on a 2-yard run after a short punt and a 25-yard return by D’Ernest Johnson gave the Bulls the ball at the Navy 36. The Midshipmen answered with a 55-yard run by Romine, but cornerback Deatrick Nichols forced a fumble on the next play and recovered the loose ball on the USF 22. South Florida punted, and Reynolds was promptly sacked for an 8-yard loss. He rebounded to direct a 14-play drive that produced a field goal. As the game moved into the fourth quarter, the Bulls kicked a field goal but took it off the board after Navy’s Amos Mason was offside. Four plays later, Emilio Nadelman missed a 32-yard kick with 12:45 remaining to keep the score at 17-16. By the time the Bulls got the ball back, they were in comeback mode.